Trust me when I say this is the BEST homemade Whole30 Taco seasoning recipe! This seasoning is full of flavor and goes great with ground beef, ground turkey, chicken, or adding to dips or soups. We use this Whole30 Taco Seasoning at least once a week in our house. The kids are always asking to have tacos. Of course being Whole30 compliant it is gluten free, dairy free, and low carb without sacrificing any flavor, so it is perfect for many special dietary needs and using for plenty of recipes while on the Whole30 diet. For the longest time I used to think that making my own seasonings was a huge waste of my time. I started to pay a little more attention to what was really in those store bought mixes and I decided to give it a try and never looked back! When I make my seasonings now, I double or triple the recipe, and keep them in air tight containers so I can use them on a whim at any time! Tacos are one of our weekly staple meals. I like to switch it up between ground turkey, chicken , and occasionally ground beef. I love having taco meat on hand for a few days to make a salad for myself at lunch or other dishes for dinner another night of the week. Traditional taco seasoning, like this recipe, includes onion, garlic, chili powder, cumin, paprika, salt and pepper. 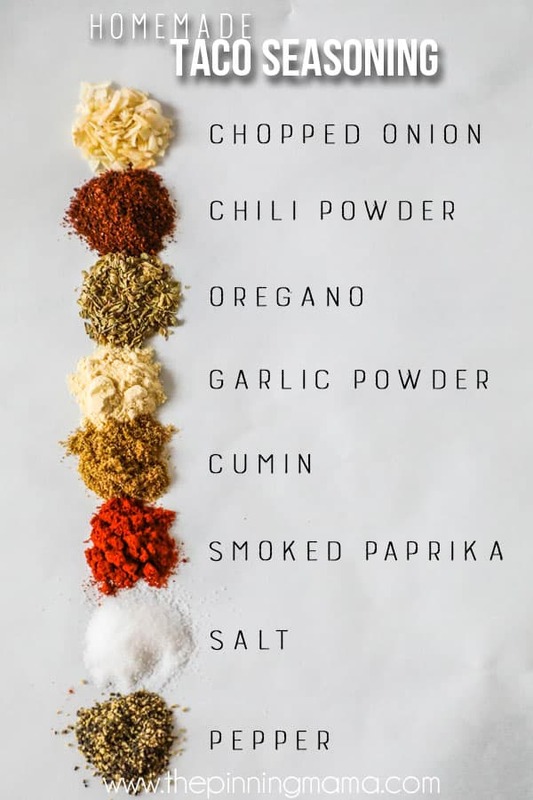 You can more or less seasoning depending on how spicy or flavored you like your meat. I will give you the recipe that I use to make taco seasoning, but cooking is all about making your food flavored perfectly to your taste, so feel free to experiment a little if you would like a little more or less in any way. If you have a favorite recipe that I missed that uses taco seasoning, leave me a note in the comments. I would love to try it! This seasoning is super simple and only takes a quick trip to the store or a look for items in your spice cabinet. I am going to answer a few questions you might have to make this recipe simple and easy to follow. You can skip down to the bottom for the full printable recipe card. Q: What side dishes can I serve this with to keep it whole30? A: Some serving suggestions to go with this recipe would be: garden salad, cauliflower rice, spiralized veggies, or a sweet potato. Q: How do I store the Whole30 Taco Seasoning once I have made it? A: You can make a large quantity of this and keep it stored in an air tight container for up to a year. Since it stays good so long, I like to buy the spices at wholesale stores and then make really big batches to keep on hand for cooking. A: This recipes is naturally whole30, gluten free, and low carb. The only modification you need to do is put it on a taco shell, or tortilla chips and/or add some cheese. A: I have lots of them! You can see all of my Whole30 recipes here, or broken down by meal with Whole30 Breakfast, Whole30 Lunch, and Whole30 Dinner recipes here. 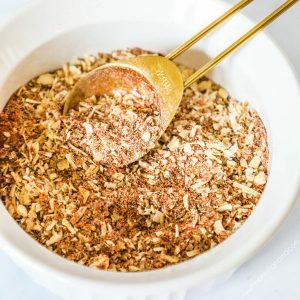 I hope you get a chance to make a batch of this Whole30 Taco seasoning and even try it in a few of the different recipe ideas! Oh and before you go!… If you need a regular rotation of recipe inspiration like me, make sure to sign up to get our emails! I send out my new favorites, the recipes my family has been devouring, and some of the best tried and true recipes. It is easy and free of course! You can click here to sign up! You will love this whole30 homemade taco seasoning. This seasoning is perfect for ground turkey, ground beef or chicken. You can also use it to season soups, appetizers, or other Mexican inspired dishes. It is packed full of flavor and naturally gluten free, dairy free and low carb. All seasonings listed are dried. 2 tbsp = 1 taco seasoning packet. This taco seasoning is naturally gluten free, dairy free, low carb and compliant for Whole30, Paleo, and Keto diets.